Zeus is confronted once more by his old nemesis. What followed was not pretty. I have always wanted a fast moving and realistic laser image of a mouse to give my indoor cat something to chase as exercise. Hope Zeus is not too rattled. I do this all the time with our cat Belle (with the exact brand and make pointer as you received for the holidays) It is always rather entertaining. For all involved not just the cat. I just have to open the drawer in which my laser pointer is stored and I have three kitties waiting to play. And they play until their tongues are hanging out and panting. We love this toy. One of our cats will play until he needs oxygen–which with his large size, is just a few minutes. Our Cat jumped at once, watched me move it around for a bit then came up and batted my hand. After that Pete ignores it now. Did the Kitty defeat the lazer-dot? I’m with family in Ohio for the holidays. My parents’ cat hates me. Every time I go to pick her up without my parents around, she hisses at me. Plus, she’s scratching up the furniture and hacking up hairballs on my mom’s most expensive Persian rug. Do they make a NERF gun with a laser sight? We made the mistake of trying to play with our cats with a laser pointer a year or so ago. Our 70lb dog saw the thing one time and decided he had to chase it too. Now we have to lock him up to play with the kitties otherwise things get broken & toddlers get bowled over. One of our cats doesn’t care about the dot one whit. The kittens love it, most of the time. A does Juju. The 30ish lb monster. One can tell when the games begin, from the shaking walls and floor. I’ve got a few kitties around here enthralled with laser pointers. The one that really likes to play with it however, plays, then spends five minutes cleaning herself, and then wants to play some more for five minutes, then cleans herself again. I put it up after the second time. My friends’ cat that I used a pointer on, played with it for awhile, figured out that it was the thing in my hand, tried to look at it directly with his eye, then gave up on it. He prefers the fishing pole with the feathers much better. Years and years ago a person I knew built their own laser “rifle”, complete with telescopic sights. They used to play with the cats in the house down the block when people left their curtains open. The cat’s humans never figured out what was happening. Cats and laser pointers, if ever there was a more entertaining moment, I haven’t found it (including having two cats track the point on the ceiling like my own little, furry radio-telescope array). WARNING: DO NOT LOOK DIRECTLY INTO THE LASER BEAM WITH REMAINING EYE. Somebody needs to make a Wii game based on kittens and laser pointers. It should play similar to the Tony Hawk games where you can trick off of any surface and it should have a house-builder so you can set up cool areas to play. I got this idea while watching one of my cats run 5 feet up the wall and do a backflip while chasing the laser. I really expected a difficulty rating and score to pop up after he did that. Would you believe there’s a patent for that? Second patent: A pet entertainment device for the entertainment of a pet. Phew. I would have been lost without that clarification as to the purpose of a pet entertainment device. MasterThief @ 8: Not to my knowledge. But they DO make one with a small flashlight faked-up to look like a laser. Our cat batted laconically, twice, at my laser pointer and then gave me the “do I LOOK like an idiot?” stare. My darling spoodle, however, will chase it for hours, with the grin of a dog who knows no finer game plastered all over her face. My wife made the mistake of buying a laser pointer for both me and my son. 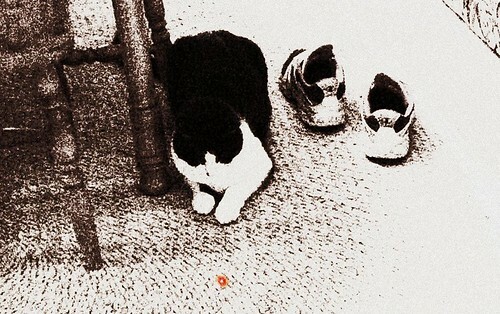 Imagine if you will a cat beset by the evil forces of RedDottia, fighting the good fight, pouncing on that dot only to find that there is not just one glowy red nemesis but two! Watching a cat try to decide mid-leap which dot to land on is rather amusing. As Eofhan said, I don’t believe they make an actual laser sight, but they do make “tactical illuminators”, and many of the newer NERF guns (including the EBF-25 Vulcan) have “tactical rails” that allow you to attach NERF accessories.